Meal prepping can seem like a long, boring time consuming task. But, what if meal planning could be complete in under THREE MINUTES. Thats right, three minutes! Now that would be a game changer! Well, this one takes only three minutes. Yep, we timed it. Yep, we had nothing better to do. The basic recipe for this is the easiest thing ever, however, you can spruce it up anywhich way you like (we have put our favourite combos at the bottom). The flavours seem to intensify overnight and the oats taste super creamy! Clean jar. A cute swing top or standard jam jar will do. Heck, you could even use a jam jar that still has some jam in it to skip out the first step! Um, that's it. Well except from spoons/knives to make the oats with, but we figured you'd already have them. 1 cup of milk, of your choosing. Dairy or otherwise. If you are interested in making your own, we have a pretty badass almond milk recipe. 1 cup of oats. I prefer rolled oats (the bigger ones) to steel cut, as I like the texture, but just go for what you like. Roughly 3 tbsp of topping. Some topping ideas are; jam, peanut butter, Nutella, fruit, honey, dried fruit. You can create your own combination of these. 2 tbsp yoghurt. This is to make to oats more creamy. It works fine without but does give a lovely thickness. If you're vegan, I'd recommend mashing a banana up in the place of yoghurt and mixing it through – it gives a creamy texture too! 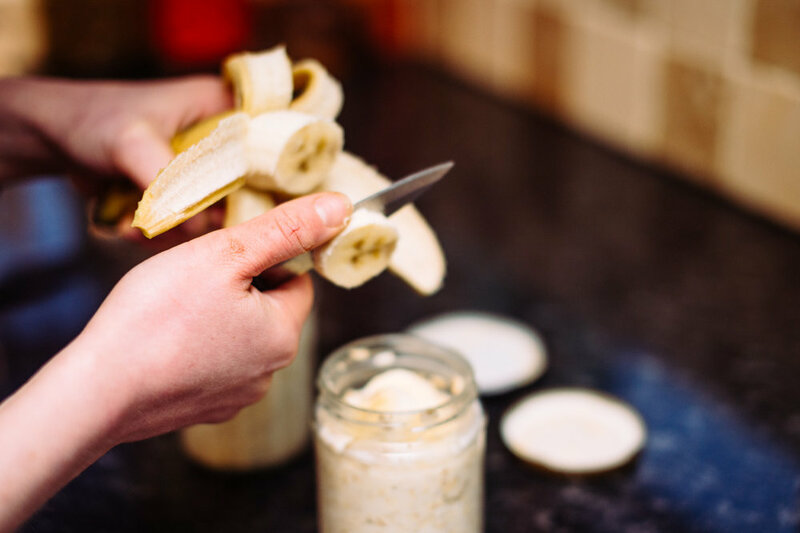 Mix your oats, milk and yoghurt (or mashed banana) together in a bowl or the jam jar you're going to use. This step is recommended if you're trying to make an Instagram worthy brekkie. Layer one of your toppings such as jam or peanut butter, along the bottom of your jar. Then put the oats on, then top it off with another topping or two! 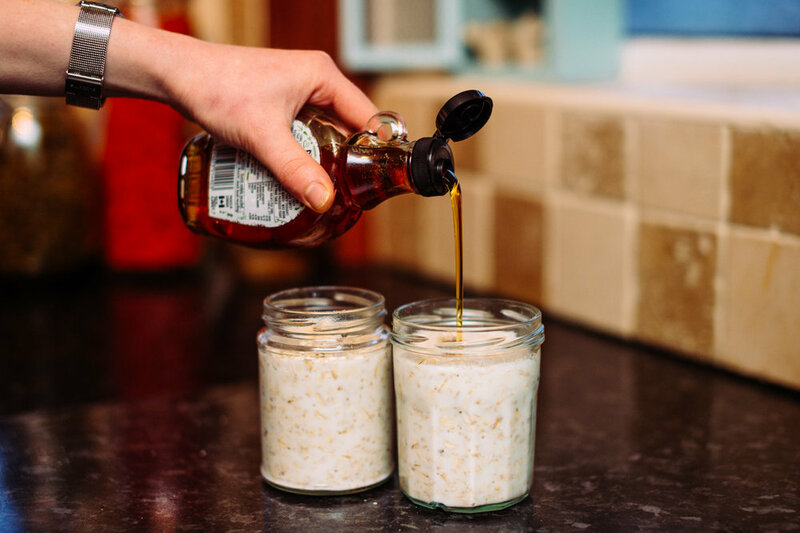 If you're not going for the likes with this breakfast, just whack it all in the jar. Give it a little shakey shake, and leave it in the fridge until you want to eat it. You can either heat this up for two minutes or eat cold. Note: Nuts and seeds are great added to this, but tend to go a little soft overnight. I prefer not adding them until the morning. Anna adds honey and banana to her oats and sprinkles dried fruits on after heating it up in the morning. Charlotte puts a layer of peanut butter along the bottom, mixes the yoghurt, milk and oats with half a tsp of cinnamon and tops the jar with some chocolate chips. Charlotte eats hers cold. Please let me know how it turned out for you! Leave a comment below and share a picture on Instagram with the hashtag #azerowastelife!